"Death solves all problems," Joseph Stalin once declared. "No man, no problem." While Stalin may be history, his management style remains in vogue. Indeed, in the latest government-sanctioned high-school history text, Stalin is described as someone who used "terror as a pragmatic means of resolving social and economic problems." And so contemporary Russian society has learned to see individual murder as a means of management as well. Earlier this month, someone shot and killed Ruslan Yamadayev, whose family helped win the Chechen war for Vladimir Putin when it sided with him against Shamil Basayev's terrorists and their radical Wahhabi allies. The Yamadayevs, however, ran afoul of Ramzan Kadyrov, the man Putin installed as ruler of Chechnya. And so Yamadayev, a hero of Russia, a colonel of the Russian Army and, until recently, a member of the Duma, was dismissed as the Chechen regional head of Putin's United Russia Party. His brother Sulim, also a hero of Russia and a Lieut. Colonel of the Russian Army (and until recently commander of the Spetsnaz Vostok battalion in Chechnya), was stripped of his command and placed under investigation by Moscow under Kadyrov's pressure. The killer shot Ruslan point-blank in downtown Moscow, penetrating an armor-plated car by way of a slit in a window while the Chechen leader was on his way out of the Kremlin, where he had pleaded Sulim's case with an important member of the administration. When I heard on the news that Ruslan had been killed, I called an acquaintance. We both respected Ruslan and were saddened by his death, but we also confessed to each other that we did not feel shock. Political murder has become such a standard part of life here that nobody is surprised anymore. Five years ago, my friend Yuri Shchekochikhin, a journalist and a member of the Duma "mysteriously" died (most likely poisoned). He ran afoul of politicians and business interests alike and received death threats constantly. Officially, prosecutors said he died of an allergy, but his family was never able to perform an independent analysis of his remains. His case is periodically reopened, but it never goes anywhere. To those of us who follow the news and try to report it, these kinds of circumstances are dispiriting. Political assassination is almost routine. Sometimes I feel it is carried out without any real strategy: either out of spite or to enforce the creeping authoritarianism of the status quo, to remind society of where things stand. The assassins and the powers behind them are on automatic; the ordinary citizen has now learned not to be surprised. Saddened, yes. Shocked, no. And so Russians were not surprised by the news out of France last week that Russian lawyer Karina Moskalenko found mercury in the car she had been using since August with her husband and three children. Moskalenko, who pursues the Russian government in international courts for human-rights abuses, now works mostly out of Strasbourg since Russian federal prosecutors sought but failed to disbar her in Moscow. Before authorities found the poison, Moskalenko had complained of suddenly deteriorating health  a frightening parallel to the case of former Russian intelligence agent Alexander Litvinenko, her onetime client, who was poisoned by polonium in Britain late in 2006. Moskalenko is a very high-profile target. She has won 27 cases against Russian authorities before the European Court of Human Rights in Strasbourg and has some 100 more pending. Moskalenko represents the jailed former Yukos CEO Mikhail Khodorkovsky and the former world chess champion Garry Kasparov, now an opposition leader. Moskalenko also represented the journalist Anna Politkovskaya, who was shot to death two years ago as she was entering her house in downtown Moscow. 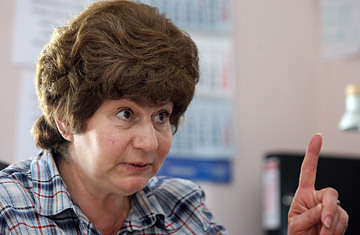 Moskalenko now represents Politkovskaya's family. Moskalenko discovered the poison just as she was set to travel to Moscow to take part in pretrial hearings for the Politkovskaya murder. Politkovskaya's murder had stirred up strong public passions of disgust over what was seen as a blatantly political assassination. (She was fearless and one of the most trusted journalists on the subject of Chechnya. She had survived a previous attempt on her life when someone attempted to poison her as she prepared to cover the siege and massacre in Beslan in 2004, perhaps because of her ties to moderate Chechens.) Her funeral turned into a powerful outcry against the brutality of Russia's politics. However, the trial of two accused accomplices to the murder will most likely be held behind closed doors at a military court. The mastermind is still apparently on the run. The public doesn't expect much from the proceedings. The judicial system doesn't have a record of delivering justice. This month, for example, marks the 14th anniversary of the murder of Dmitri Kholodov, an investigative journalist killed in his office by a booby-trapped attaché case while he was investigating corruption in the Russian army. The long trial of his alleged murderers ended in their acquittal; a colonel charged with the murder won compensation for his forced retirement and pretrial confinement. Kholodov's friends and colleagues complain of a gross miscarriage of justice, but nothing has been done. The murder is officially unsolved; the crime is going unpunished.